“Dulcie” was built in 1902 (approx.) she has pitch pine planking on oak frames with pine decking. My Boat, "Dulcie" is about to need some/all of her deck planks replacing. At the moment, she has pine decks. My question is this, what kind of pine should I use, as there is no mention of the kind of pine used. The hull is pitch pine on oak. The other question is:- when I cut the lengths of pine, should the edges be square, or should they be at a slight angle. It looks fairly straight forward job????. You may be interested to know that my late parents owned her,and bought her from the first owner / friends. She was an open boat with gunter rigg,followed by gaff, then as now, no engine when built, had a skull on the stern or should I say sweep. The first engine was a converted Austin seven (installed in St Mawes)just after the war. Then the one you have, this was followed by the cabin...Dulcie had a centre plate keel removed to give way for engine. Boat has quite a history, have many pic's. Sad to hear that no one want's to take her on...she's a river Falmouth boat. I've not been about much over the last few months, sorry. I'm giving away "Dulcie" to anyone who would like to have her, but if anyone WOULD like to make a offer!!. Hi all, and thank you. Hi Dave I would go for columbian pine nice to work and stands upto the weather very well. I think if I was doing the job I would remove the decks then lay say 4mm or 6mm ply then lay you planking on top of that I use a lot of a sealer/Glue called sikaflex which is expensive but you just cant beat it there is a product on ebay that is very simeler called PU18 that is a lot cheaper and does the same job after the placnks are laid give it a good sanding then varnish. Job done and good as new with out leaks. I do apologise for banging on about plywood, sorry I had it stuck in my mind that your decks had been painted. But you did mention "Coelin???" did you mean "Coelan"? If so it does have an excellent reputation. I haven’t used it myself but I have spoken to several boat owners who swear by it. Tung oil looks great when first applied and it’s easy to slap on but it does darken considerably when exposed to weathering and I do mean considerably. If I were to re-varnish the decks, what varnish would you recommend, or, could I use tong oil. It seem it would be such a great shame to cover the planks with anything. They look beautiful as they are, but need "sprucing up". Well, the ‘bedding compound’ that I used and which is still ok after 10 (?) years came from my local DIY store. I can’t remember the brand name but it was sold as a flexible coating/sealer for flat roofs. If you were in the US of A, I would recommend ‘Dolfinite Bedding Compound’ but sometimes it’s worth looking at what is easily available locally. Once laid just prime and paint the ply with deck paint. The main thing is to make sure that the edges of the ply are well sealed. Someone suggested to me that I use well-known brand of masonry paint as a non-slip deck coating, I did try it, it wasn't a success and had to be removed. thanks again for you info. Hi Mike, thanks again for you info. Supose I cant have it all ways. When you said paint the plywood, do you literally mean paint the plywood. If that's the case, do i paint it with some form of undercoat first?, and what kind of bedding compound do I use? Over the years those canvas covered decks have been treated in various ways. Some have simply replaced the painted canvas, some have replaced it with other coverings such as ‘Treadmaster’ and others have replaced the canvas with fiberglass and epoxy and others, such as myself, have covered the planking with plywood. On my decks I replaced the canvas with one layer of ¼ inch marine plywood, tacked down on a flexible bedding compound, on top of the original planking and then painted. I would have preferred to have had a planked deck but I also wanted to be able to sleep onboard without being dripped upon. The plywood covering seemed to me to be the simplest solution. I would imagine that marine plywood should be easier (and cheaper) for you to source on the island. The deck were originally covered with canvas and painted, but that was removed a long time ago and finished with something like varnish, Coelin???. The deck planks are not tongue and groove, as I replaced some of the Caulking a couple of years ago. Unfortunately, a lot of the "varnish" is now peeling of and the decks are now being slowly exposed. I have her covered, so at least the weather can't get to her at the mow. I have not thought of covering her with ply, would that mean removing all planks?, not sure my DIY'ing would stretch to that, given the time it would probably take. There are a number of companies in the UK that could supply Pitch pine, (Reclaimed), and cut to size for me. If I used that, could I not use good quality Tung oil once or twice a year?? to keep them in good shape. Your thoughts would be much appreciated Mike. 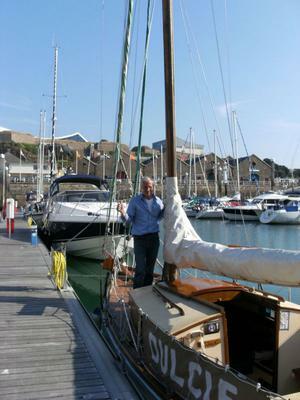 I'm discovering Jersey, Channel Islands, may be the wrong place to have such an old boat, such as Dulice. Just looking at you photos and it looks as though the deck has been painted or is that just the photo (or my eyesight)? So I was wondering if the deck had originally been covered with painted canvas? If it had then the planking could be tongue and grooved? If not was the deck laid over a substrate such as plywood? Sorry for all the questions but any answer will depend on how she was originally planked. As for sourcing new timber, that is one of the major problems when it comes to restoring an old boat. Originally she would probably have been planked using quarter-sawn heart-wood but that has become virtually impossible to find. Certainly you would want to find some resin-rich pine from old growth timber with close growth rings, perhaps Oregon Pine from Canada. Pine decks do tend to wear out quite quickly and they can get worse the deeper one scrapes. Have you considered covering the deck with plywood?